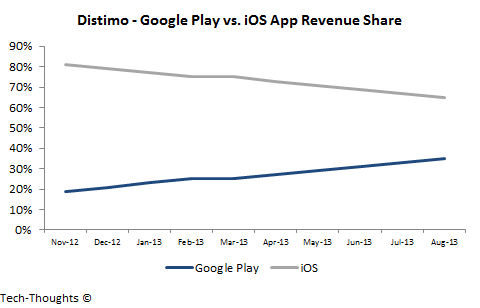 Distimo's estimates of Appstore revenue share showed that Google Play held 35% and iOS held 65% of the market. While revenue on both platforms is growing, it is interesting to note that Google Play's app revenue share has doubled in just 10 months. These figures are also consistent with App Annie's gaming app revenue estimates from last month. 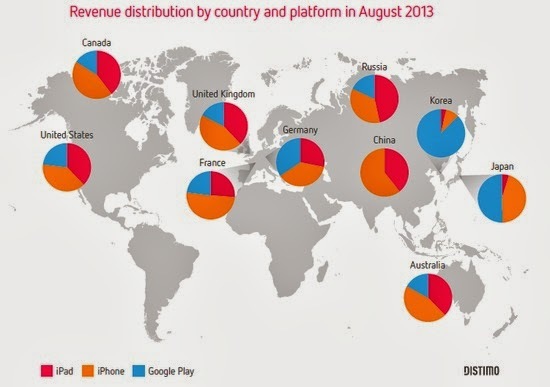 If these trends continue, Google Play is likely to match iOS in App revenue by mid-late 2014. Comparing the region-wise revenue split to Distimo's previous reports, we can see that Google Play has made the strongest gains in European countries, while maintaining its share in Korea, Japan, US and Australia. Unsurprisingly, this is consistent with Android's market share gains in these countries. Another factor to consider is that Distimo's study covers iOS revenue in China, but not revenue from third party appstores. Also, it has been reported that third party Android app stores in China generate roughly 80% of gaming app revenue in the region, compared to just 20% for iOS. Even if we take all app categories into account, that split is unlikely to show large variance. 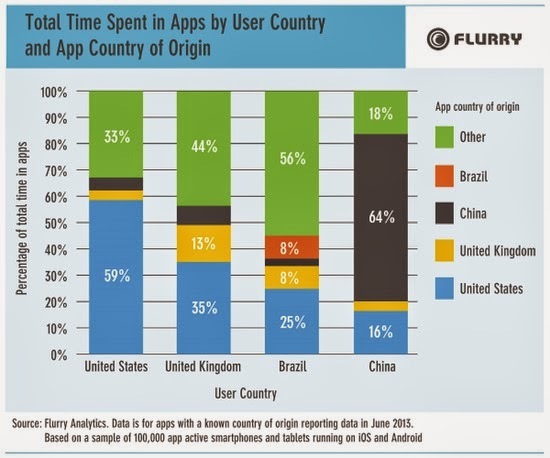 According to data from Flurry, these trends are being driven by app localization. The proportion of apps developed in the US has dropped from 45% in 2011 to 36% in 2013. Local developers in Non-US markets are increasingly targeting the Android platform because that's where their users are. This trend is likely to continue as tablet penetration increases among mainstream users. And, of course, aggregate engagement on the Android platform will continue to increase as volume increases.